Inspiration. We crave it. We need it. We love it. But inspiration alone is a salve that does not cure. Because it rarely translates into positive lifestyle adaptations sustained over time. For that you need something called purpose. Purpose derives from a keen awareness of self. An awareness that cannot be found in externalities but instead emanates from the deep recesses of your soul — a place far removed from the dopamine-inducing inspiration hits we restlessly seek outside ourselves. Indeed, purpose is an inside job. So this week, we turn inward. A conversation designed to cultivate that awareness, amplify intuition, and enliven the soul so that we can more deeply connect with our unique purpose and awaken to our highest, most authentic selves. 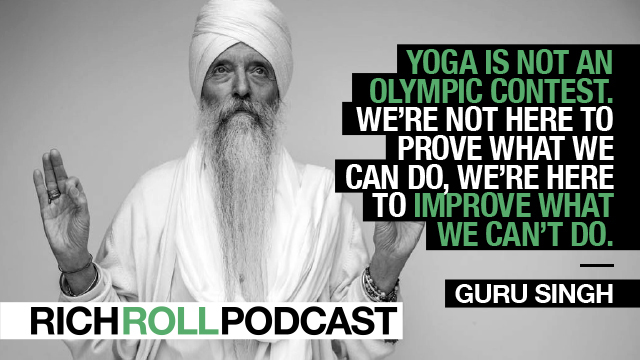 I can think of no better steward to ignite this process than master spiritual teacher and celebrated Kundalini yoga wizard Guru Singh (@gurusinghyogi). Imagine a modern-day rock star Gandalf dropping mad guitar licks between pearls of timeless wisdom that beautifully fuse of Eastern mysticism with Western pragmatism and you start to get the picture. Named “Best Guru in LA” by Los Angeles magazine, for the last 40 years Guru Singh has been studying and teaching Kundalini Yoga – a 5,000 year old ancient science and school of yoga focused on awakening the primal energy known as shakti for the purpose of spiritual enlightenment. He is the author of several books (enumerated below) and a powerful lecturer uplifting thousands worldwide. An extraordinary teacher, he also serves as a behind-the-scenes guide to many a luminary, including Fortune 500 CEOs, athletes, artists and even Tony Robbins. Simply put, Guru Singh is one of the coolest people I have ever met — a huge, beautiful consciousness I’m proud to call friend. It’s an honor to share his story and wisdom with you today. My hope is that that this conversation will catalyze your desire to peer more deeply inward. That it will spark a yearning to more thoroughly cultivate your latent intuition. And ultimately that it helps set a trajectory for your journey towards the ultimate superpower — unlimited awareness. To rise up, you gotta lay down. It is there that you will find purpose. Miri Piri Academy’s mission is to train the future leaders, teachers and healers of the world through rigorous discipline, quality academics and a strong sense of self—learn more by visiting miripiriacademy.org.